To be or not to be? I’ve fought this concept like I fought the idea of learning to work on a computer back when Maine Governor King came up with the brilliant idea to give every seventh grader a laptop to use. I was teaching seventh grade at the time so it fell to me to learn to use a computer. Now it seems that a BLOG is playing more and more in my mind as a valuable tool to be used in conjunction with my new vocation—WRITER. Yes, I’ve flirted with the dream of seeing some of my voluminous essays, poems, or internal conversations taking shape in a book or two. 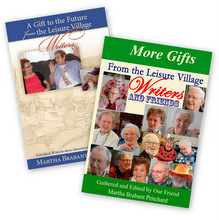 Now, with the publication of A Gift to the Future from the Leisure Village Writers, I’m learning, at the ripened age of sixty-seven, that there are many unanticipated aspects of this brave new world of publishing that will require me to grow up—again. BLOGging. The word reminds me of gagging. And it is the word more than anything that has fed my antagonistic attitude toward this aspect of self-promotion—which I also find distasteful but newly necessary. And maybe if it was just me, just my work as I’d always anticipated, maybe I’d still be fighting within myself to promote through BLOGging. But it isn’t. I am the voice of the Writers of Leisure Village. I’m twenty years younger than most of these beautiful writers and they have entrusted me with their work. To be on not to be? Well, for the sake of the Elders whom I have come to respect and love, I will make this attempt—nay, this inroad into the future of the way things are. I was looking for the trick our editor used to designate divisions within the text of our book and I discovered instead “clipart.” Now I used this when I was teaching seventh grade and I found it amusing, but I really wanted something less pushy for this BLOG-thing. However, until my web-guru wakes up, I’ll stick these leaves in. “Web-guru” is my own term for the younger woman who has kept current with the how-tos and the why-tos of the cyber world. She’s my version of a guardian angel whom I have to beg to send me an invoice when I know I owe her more than she’s going to charge me for her work. Until I figure out how to build this BLOG-thing, she’ll take care of it for me and I’ll just send her my rambling thoughts. Time for more leaves? Maybe this is the place to insert this email I opened last night. It gave me such a boost that I couldn’t put off the BLOG-thing any longer. 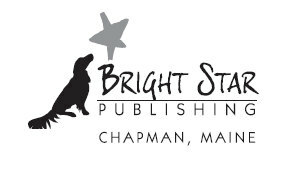 As soon as I saw the article about the writing group and the book in the Bangor Daily News, I ordered a copy. I remember my Aunt Jo ( Allen ) talking about a writing group, and now I more clearly understand what she was talking about! 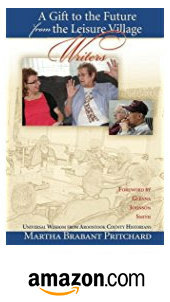 The book is a treasure, and I am grateful that you have encouraged voices to preserve the history and wisdom of those from Aroostook County. My aunt and my mother ( Sis ) have so many childhood memories that they have shared with me, and I have always admired my aunt&#39;s writing . I wanted to be sure that Aunt Jo has a copy of this book. I assume that she does, but I will order her one if she does not. I visited her this summer ( I live in mid-coast Maine ), and for the first time, we did not go out for lunch or for a drive. Both my mother and my aunt are less mobile now, so I came north alone to see my cousins and visit. Thank you for your dedication and for nurturing these writers as they shared their memories. 1. How do I get rid of the yellow color that happens when I cut and paste from the email to a word document? 2. 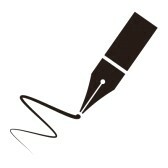 Can I use a person’s name when I enter a correspondence on a BLOG? 3. Will BLOG-readers want to share this sort of chest-puffing? 4. Is it pertinent to insert my response to this writer? Talk about powerful! What a boost your letter is tonight as I fret and fuss about our Book Launch Party next Sunday at Leisure Village. Our dear authors were the first to receive copies of their book and are they ever proud! Your Aunt Jo's stories have spawned so much feedback from so many people in town. One man wrote about his Grandfather who had worked for "Nanny" Della Hoyt Stevens in her gardens. He stepped on a rusty nail and lost his leg but lived to be 90 with a wooden leg. Can you imagine! I hope you don't mind but I have to pass your beautiful message on to others, including our book editor who will be equally thrilled. 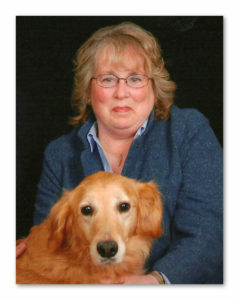 She and I burned the midnight oil many weeks during the final stages of publication. In September I had promised the writers that we'd try to have the books in time for Christmas. 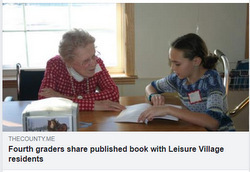 What a gift to see the proud sweet faces of these writers who still have so much to give as they sign copies for the Presque Isle Historical Society, the PI City Council, the local libraries and soon the schools in the area. One family is reading the stories to their children at bedtime. Through this process I've become convinced that every retirement community should count a Writing Facilitator on the same level of importance as a physical therapist and occupational therapist. I have seen such improvement in the spirits of these elders as they eagerly share their stories. Thank you for your kind and encouraging words. We have already begun to gather stories for Volume Two for next Christmas. So far I’ve assumed that potential readers will have found this BLOG because they are familiar with the book to which I refer. Perhaps this isn’t necessarily so and I should take the time to discuss A Gift to the Future from the Leisure Village Writers. To borrow a phrase from a well-known musical by Steven Sondheim, A Funny Thing Happened on the way to . . . bringing my own book to the end of an eight year writing adventure. I felt that I wanted/needed input from an audience to determine once and for all if my memoir-turned-biography was ready to fly. I’d spent many fruitless hours, days, weeks, months trying to secure a literary agent. I’d sent hundreds of dollars to contests as reading fees with excerpts from my 108,000 word document with no takers. I’d finally reached the conclusion that if this book, From Bombs to Babies was ever to be published, I was going to have to tackle the job myself. “Publishing Platform” – my new nightmare reality. I didn’t have one and really only wanted to write, not build a platform. But in the interest of striking out on that path I reached out to a church coffee house event. I told a wolf story from my mother’s repertoire and was encouraged to go a bit further into public life. Next I approached the local library with the idea of offering a weekly storytelling spot. That idea fizzled, not through lack of effort—I packed up borrowed china teacups, teapot, and cookies each week, hauled them upstairs to my designated storytelling venue, and waited. And waited. And gave away cookies and tea, greeted and waved farewell to my hungry audiences, and waited some more. I think we gave this an eight week trial and when it became obvious that I could not compete with the bank of computers in the adjoining area, I gave up. At the library. Next I approached the folks at Leisure Village with my newly minted business cards that declared me a writer and storyteller. Tina, the activities director, welcomed me to give storytelling a try with the residents. I was assigned to the library on the second floor of the retirement facility and the people who came that first day have stuck with me for nearly two years. Our numbers grew rapidly and we were soon meeting in the dining room with Tina rearranging her “Fitter-Sitters” exercise group to give us the hour we needed. I encouraged the participants to share anything they might have written and they encouraged me to read them my entire manuscript rather than trying to tell my stories. “I don’t think I have a choice. These people want to share their writing skills and I’m thrilled with their work!” By this time I had given everybody a new notebook, pack of pencils and pens, artist tablet (in case they wanted to illustrate their work), colored pencils, and new crayons. We had a nice conversation about how the smell of new crayons hasn’t changed in fifty years. Material kept flying between us and it wasn’t unusual for me to lose track of some of their pieces, but only temporarily. They’d remind me. By December of 2015 I had collated their hodge-podge of photocopied, handwritten, and long-ago- typed material. I reproduced everything on my small home copier and punched holes. For Christmas that year they each had a copy of their stories bound in a three ring notebook. And they were delighted. But they weren’t done. The novelty of writing hadn’t worn off yet. Some of our faithful participants had lost their ability to organize their thoughts onto paper but retained their desire to write, so I started interviewing them. I began using a tape recorder so I could preserve their exact words. I typed these pieces up, copied and handed them out, pre-punched, so they could be added to the individual notebooks. And then it hit me! We were writing a book! When I dared to utter those words, my elder writers protested. One thing about life; if you remain open to new ideas, you are bound to surprise yourself. We had recently celebrated the 100th birthday of one of our most prolific writers. As I looked around I became aware, maybe for the first time in our many months together, that every one of my new friends was closing in on this amazing age. I felt an urgency (which I didn’t share with them) about getting their book published before I tackled my own. As they objected in an effort to save me from myself, I insisted that by publishing their book first I could make all the mistakes on theirs and reserve perfection for my book. Time for some more leaves. Happily we are all still learning. And nobody has dropped out of our group because of lack of interest. A few are getting more tired and some new faces have begun to show interest now that they can see that we know how to turn ideas into a book. And there will be a Volume Two. But we’ll shorten the title a bit. A Gift to the Future from the Leisure Village Writers is a bit cumbersome.